When you first get cases of citrus for the Band Fruit Fundraiser, your family is gobbling up oranges, grapefruit, and tangerines as fast as you can peel them. My family is as spoiled as the composting pig. I peel the oranges for them as well. I have that hook thingamajig from Tupperware. It makes it easy. But after a while, the joy of juice bursting in your mouth pales a bit. The palate gets a bit tired of such unrelenting sweet goodness. Like living in Hawaii with unrelenting sunshine. It happened to me! So you get creative, and start serving the citrus as the main event at breakfast. That goes over well, so for special people you serve salmon and oranges with dinner. You throw orange sections in spinach salads and fruit salads. [And you freeze the leftovers of those fruit salads for smoothies.] You buy apples. And grapes. And you kinda forget about the handful of citrus still in your crisper. As Norah Jones just sang on my stereo, <they're> just sitting here, waiting for you to come on home <and make a muffin>. I wanted to make another muffin without added refined sugar, this time on purpose, so I grabbed the honey out of the pantry. Honey pairs very nicely with citrus. Add in the whole grains--oats and wheat--and you're good to go. This muffin is a great use for leftover peeled citrus. Chop the citrus finely, or you will have odd lumps sticking up here and there. You'll live if you do. I did. Kids still ate them. I like to soak my oats in buttermilk overnight because I like the texture of the resulting whole grain muffin, but even an hour's soak makes a difference if you didn't mix these up the night before. The night before, or at least an hour before you're ready to bake, combine the oats and buttermilk in a large bowl and set aside. This can hang on your counter or in the fridge for 1 to 12 hours. When you're ready to bake, gather the rest of your ingredients. Take a photo. Preheat oven to 400 degrees Fahrenheit. Spray a 12 space muffin pan with oil spray and set aside. Add the citrus, egg, oil, and honey to the bowl. Stir to combine. Dump the dry ingredients on top. Stir until just barely mixed. Scoop batter into prepared pan. Bake for 15-18 minutes until tops are golden. Cool in pan 5 minutes before turning out onto a rack to finish cooling. Want more ideas for Band Fruit Fundraiser Citrus? Come back on Wednesday for a recipe roundup! It's official. Band fund raiser season is upon us. Now all I need is a son who's in the band so I can join in on the fun. Or I suppose I could just buy oranges but where's the fun in that?! 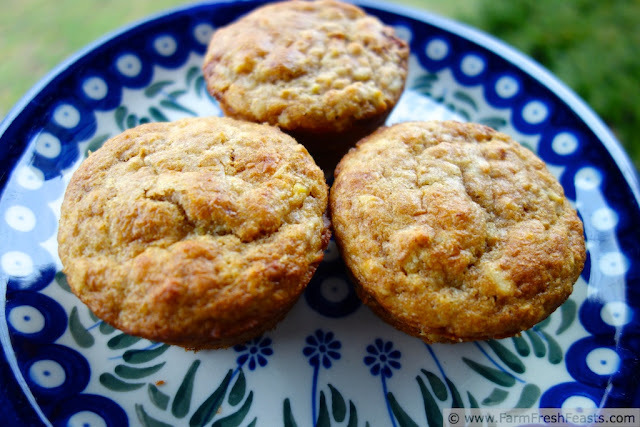 I love your muffins; yes all of them, although I particularly love the use of citrus and honey here. I can't wait to try them. I got an email from local harvest.org where you can get a case of citrus shipped from a farmer in Florida--there's always that option if the band near you (or wheelchair basketball team) doesn't do a fruit fundraiser. We don't have that particular fundraiser, but we do like our citrus. 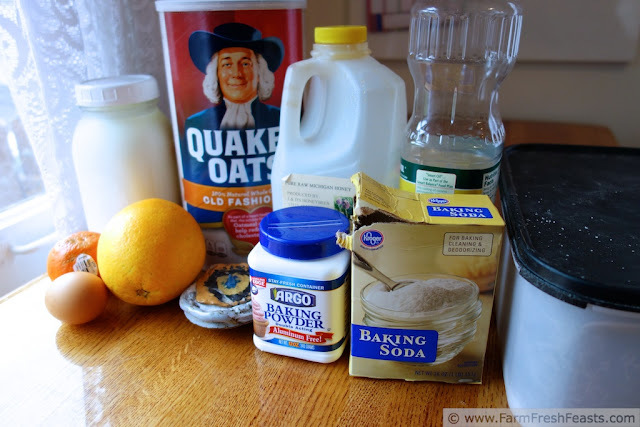 This sounds like a perfect way to use some of it during the winter citrus season. We are taking a bit of a break from muffins – I made way too many of the Almond Chocolate Chip variety when I was perfecting the recipe. When we are ready for muffins again, these sound like just the ticket. Different as night and day from what I had been making. Love citrus and honey together. Throw in oats and I am so there! I'd be delighted to take some Almond Chocolate Chip muffins off your hands! I ended up freezing half a dozen muffins the other day, and will whip them out one night when I realize there's nothing for breakfast in the morning. But that day is not today--just got plenty of eggs! I just love a good muffin--they are so portable and tasty. The citrus and honey is such a bright flavor combo too! For my kids muffins serve as breakfast and after school snack, so I'm delighted with the 'cook once eat twice' aspect as well. Your rolled oats joke make me giggle. These muffins look delicious and I definitely can see getting a little burned out on all that citrus - even though it is great. Thank you thank you! Sometimes I feel like tapping the mic on the laptop and asking if this thing is on, but then I realize that something I find amusing at 11:30 pm may not always been seen as amusing to others. 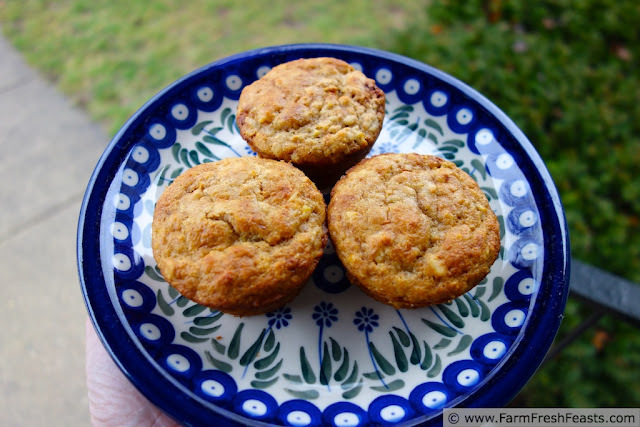 Happy to be featuring these yummy muffins at Red Cottage Chronicles today! Thanks for linking up at Tasty Tuesdays! Thank you so much--it's most appreciated!